I talked about Irana Douer and her illustrations on decor8 before, but I just heard from her and viewed her latest work so it's time to highlight this artist again. This time, Miss Irana is experimenting with fabric (last time it was ceramic), a pillow design for Australian gallery Third Drawer Down available here. Lovely! 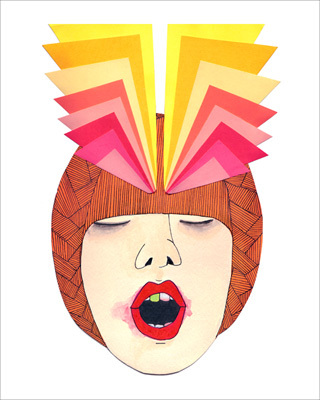 Living in Buenos Aires, Irana is a freelance illustrator, an art student, and curator of online magazine Ruby Mag. 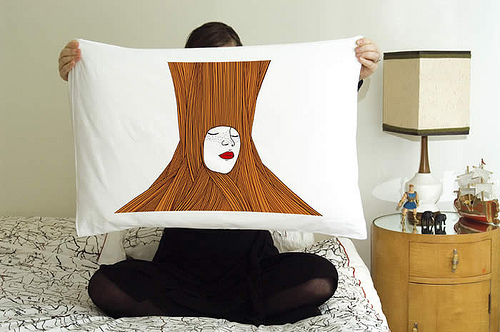 I rather like the idea of having such an special pillow to lay my head on for creative dreams at night... About her work, which focuses mainly on women, she says, "I am interested in women, their thoughts and feelings, especially sadness. Broken hearted women who just want to hide from the world that surrounds them. Masks, hair, closed eyes, anything goes. But that are still very strong and move on and never lose hope." Thanks Irana for sharing this! She also just released a colorful 8 x 10 giclee print ($40) in a limited run of 100 over at Poketo in case you're interested. Lovin' these bright hot hues.